Best Rated Sole Fitness Home Ellipticals | Comparison and Reviews: This is a roundup, comparison and reviews of the best rated Sole home elliptical trainers. Sole has 4 home elliptical models, with the added feature of Bluetooth. The newer models now have larger backlit LCD screens. 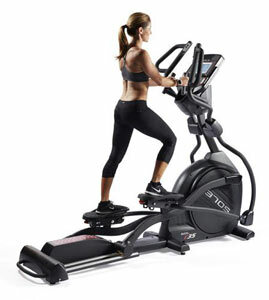 Sole has some of the highest rated Elliptical Machines available today. Many have the power incline feature. These are solid, well built elliptical trainers with all the latest features, and long warranties. Elliptical Trainers provide an excellent form of aerobic exercise at home that you can do no matter what the weather is outside. Elliptical machines are easier on your joints than other forms of cardio exercise. These low-impact exercise machines also build arm and leg strength. You can compare each Sole Fitness elliptical trainer below by features such as workout programs, reviews, maximum weight capacity, price, and other features. A glossary of terms is available at the bottom of this page. The Schwinn 470 Elliptical Trainer is an excellent medium duty elliptical under $800. If you upgrade to the 470, you will get a well built elliptical with a powered (motorized) incline ramp, 29 workout programs, 25 levels of magnetic resistance, 300 lb. weight limit, built-in speakers & Fan, Bluetooth with APP, a Backlit LCD screen. The Schwinn 470 has received outstanding reviews. The Schwinn 470 elliptical is our “BEST OF 2019” for ellipticals under $800. Power Incline/Incline Ramp = The Sole E55, E95 and E98 have an incline ramp which can allow you to simulate hills and make your workout harder. You press a button to raise the incline ramp to your preferred position. The ramp angle is fully adjustable from a level plane up to 40 degrees, so you can individually target and work all major lower body muscles. Maximum User Weight = Each elliptical trainer depending on its construction has a maximum user weight limit. More expensive trainers generally can handle more weight. So if the limit is 300 lbs, and you are over 300 lbs., you should not buy this trainer but look for one with a higher weight limit. If you weigh substantially less than the weight limit, this will put less strain on the machine and parts. Sole Ellipticals Maximum Weights go from 350 lbs. (E35) to 400 lbs. (E95 and E98). Magnetic Brake Resistance = Most Elliptical Machines use magnetic resistance which offers resistance through magnetic fields. One type of magnetic resistance is ECB (described below). Magnetic resistance is more maintainence free than those older technologies that relied on friction pads and belts. Magnetic resistance braking is smoother to use is quieter than other types of resistance mechanisms. Bluetooth® & APP = The latest SOLE ellipticals have built-in Bluetooth with connectivity to send workout data to a Sole APP on your smartphone or tablet. ECB Resistance = ECB Resistance is a high quality form of magnetic brake resistance. ECB = eddy current brake. All of Sole Ellipticals use ECB Magnetic Resistance. Heart Rate Control = The E35, E55, E95 and E98 have heart rate programs that allow you to control your workout by heartrate, and keep you within a certain cardio range. LED/LCD Display = All of Sole Ellipticals use a backlit LCD screen. This screen will provide information (such as time, calorie burn, heart rate, distance). The E25 has a 6.5-inch LCD screen, the E35 has a 7.5-inch LCD screen, while the E95 and E98 have the largest LCD screen at 10.1-inches. Light Commercial = The Sole E98 is a light commercial model, which means it is built to be more durable than most home ellipticals. Built for the commercial environment, with its articulating foot pedals to its heavy 32 lb flywheel. Uses heavy duty 38 mm steel.